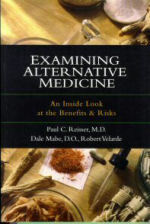 Books | Examining Alternative Medicine: An Inside Look at the Benefits & Risks | Watchman Fellowship, Inc. Contents: 288 pages, notes, index. Herbal therapy, homeopathy, acupuncture, energy healing, yoga, and therapeutic touch. These are just a few of the many new health alternatives that have joined the more established therapies of chiropractic care, massage, weight-loss programs and vitamin therapy to make alternative medicine not only mainstream but very big business. Some surveys show that there are as many patient visits to alternative providers each year as to traditional health care providers. Two of the best-known advocates of new perspectives on health, Andrew Weil and Deepak Chopra, sell millions of books. How should we evaluate these new options? Is all this a fad or is it here to stay? What are their benefits and risks? Do some therapies have spiritual underpinnings that are at odds with a biblical framework? These are the questions this book answers in a sound, frank and evenhanded manner. This book is must reading for anyone who has tried or considered some of the new treatments, or who has friends or family members seeking new roads to health.This book examines many new alternative medicine treatments such as herbal therapy, homeopathy, acupuncture, yoga, and therapeutic touch. These treatments are gaining widespread support, and this book attempts to explain the risks and benefits from both a medical and spiritual standpoint. It is a must read for anyone who has tried or considered trying one of these new treatments, or who has a family member seeking such help.